Mix in bowl chili sauce, lemon juice, butter, salt, black pepper and ground chili, pour prepared wings with marinade, stir well, cover and leave at room temperature for 1 hour. Heat the oven at 220℃, cover baking sheet with parchment, spread wings in marinade on baking sheet, sprinkle again with olive oil. Bake wings for 25 min, occasionally grease with a brush by excreted juice. In 3 min till readiness turn on the fan for a crust, but not for long, not to dry gentle wings. 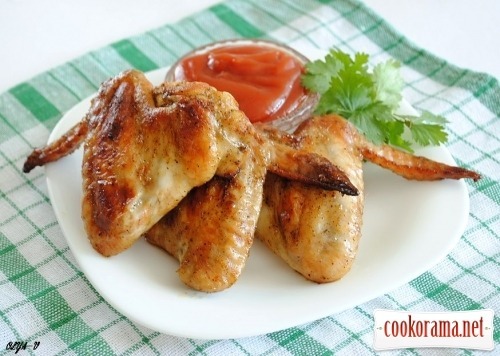 Top of recipe "Chicken wings in spicy marinade"
А куда подевались все фото у Ваших рецептов?